SOIL is proud of the research and promotion work that we have done over the past 6 years with ecological sanitation (EcoSan). However, for EcoSan to take root as a viable response to Haiti’s sanitation crisis, we must provide long-lasting economic benefits as well as health and environmental value. This week we celebrate a step in that direction as local contractors begin to take over the production of our toilets using all locally available materials. We are pleased to announce that we are now subcontracting out the building of our wooden and concrete EcoSan toilet models for the first time. To manufacture our wooden EcoSan toilet model, a call was put out for qualified local carpenters and a final five were chosen. These men were shown the basics of our design, presented our criteria, and given $50 US. The challenge – to create a toilet for under $50 US which meets all of the design criteria identified by our community users. A few days later, each returned with a completed model and a bid for 25 toilets. Contracts were signed with three of the carpenters. In an effort to expand opportunities for women, we changed tactics for contracting out the concrete models. 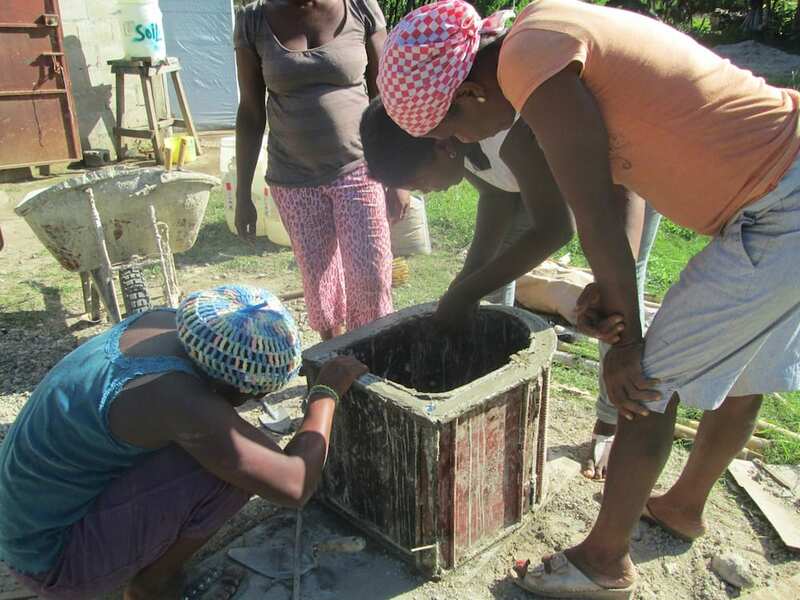 Five women were chosen from a group of volunteers to undergo an intensive two-week training course to construct the toilet using a reinforced concrete mold design. They were provided meals while they learned to fabricate the metal reinforcement, prepare the mold, mix and pour the concrete, and finish the toilet. After completing a final examination, they were offered a contract to build 25 toilets as a cooperative effort. This is a first step towards taking ourselves out of the production phase. People will be able to buy a SOIL-approved toilet directly from the independent manufacturer and then pay for monthly pick-up service. Check out the teams in action! 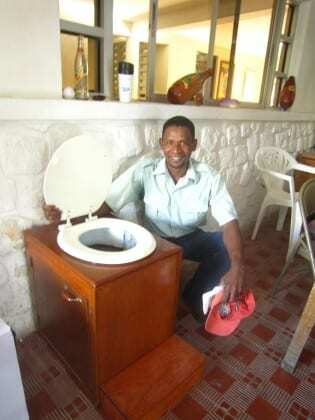 2 Replies to "Local Contractors Take Over Household Toilet Production"
I would like to have a contact with you because your experience on this system . Thank’s for your reply and best regards. If you would like to contact us by E-mail about your project, feel free to write to info@oursoil.org.